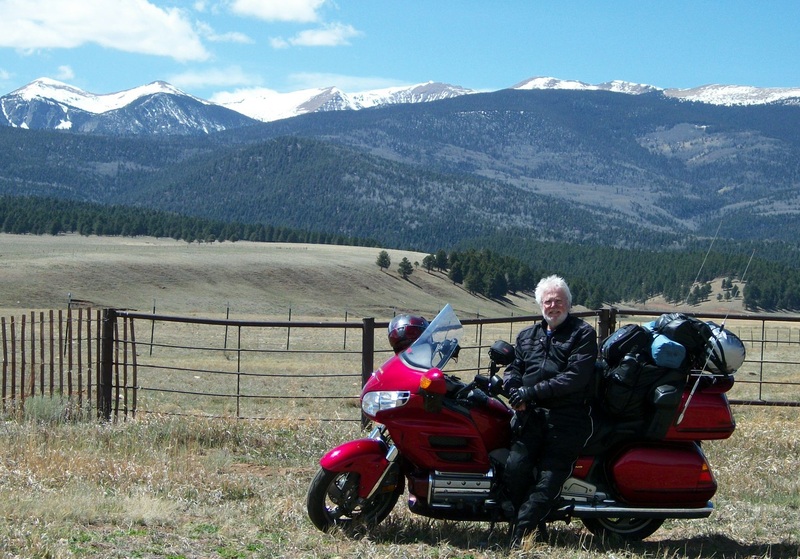 The winds I experienced as I rode south from Pueblo, Colorado, were not a momentary phenomenon; they strengthened and stayed with me for nearly all of my three weeks touring in the southwest. I didn’t have an inkling of that prospect until the next day, so I’ll save that revelation for tomorrow’s entry. I did get some shelter from the winds after I crossed over Raton Pass and into the valleys of northern New Mexico. I was hit only occasionally by episodes of dangerous gusts. Unfortunately, those occurred on steep, twisty roadways at higher elevations, first around Cimarron and Angel Fire, and then on the upper peaks along The High Road to Taos. To be more precise, on my track, that was The High Road from Taos; it gets its name for its run northward out of Santa Fe. 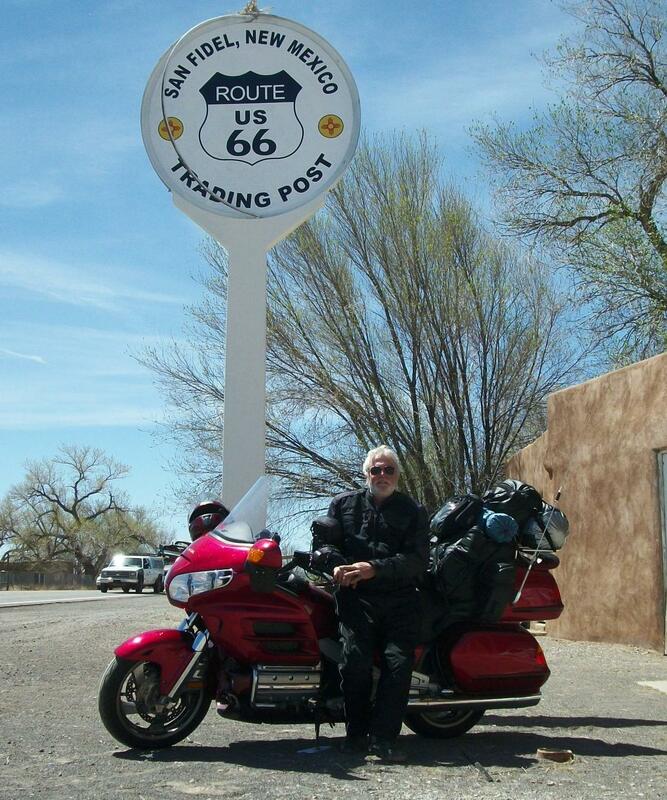 I rode it from Taos southward to Santa Fe and enjoyed it immensely, arriving in New Mexico’s lovely capital just at dinnertime. I made the simplest of campsites at Hyde State Park, and took my road weary bones to bed. I knew that, at 330 miles, this was the longest riding day planned into my three-week itinerary, so I tried to get an early start after a mediocre night’s sleep in the mummy bag. I rejoined Interstate 25 and looped southward to and through Albuquerque. It started as a comfortable ride in cool, morning air, and I gave little thought to yesterday’s turbulence. The first gusts hit at mid-morning as I was dodging herds of tractor-trailer trucks and traffic-weaving tourists, and just as we approached the labyrinth of lanes that would shunt us from I-25 to one direction or another on the east-west I-40. By the time I had made that transition–headed west on the new highway–the warming, desert air was showing off its energy. Yesterday’s westerlies had veered into the north, and every 35 mph blast from my right threatened to push me out of the slow, right-hand lane into the path of the giant trucks passing in a steady stream on my left. Each of them produced a wall of wind that hammered me from that side. I fought the forces of man and nature for fifty miles, always tense, often frightened, and then finally… terrified. I was hit simultaneously by a powerful wind blast from the right and what I have to call the shock-wave off the front of a truck passing on my left. The resulting convergence of forces felt as though they would lift my wheels right off the highway. This is a 900-pound bike with a 200-pound rider and another 150 pounds of gear piled aboard, and I felt like a puny second-in-command of its direction. I peeled off at the next exit ramp and gratefully found myself in a crossroads village populated by members of the Laguna tribe of the Pueblo people. They operate a modern and well stocked general store/gas station, and the place is the home of the “World Famous Laguna Burger.” I opted for an apple and a bottle of water and sat down on the front porch to wait for my blood pressure to come down. Gettin’ my kicks on the historic highway. AZ, and I know you’re not going to let me breeze past that town’s name without some effort to explain it, so here goes: Legend has it that sometime late in the 19th century two rivals for leadership in the town (established in 1870) decided not to shoot it out on Main Street but to leave the competition to the turn of a card. The one who could “show low” would win, and the other would leave town. The winner reportedly turned a deuce. Hey, I’m as big a sucker for a good yarn as the next guy, and this is where I was going to spend the night. Besides, it was an excellent jumping off point for the next day’s ride to Winslow and Sedona, and Cottonwood… another town name to stir the imagination. There were long stretches of road construction in the 30 miles between Snowflake and my return to I-40 at Holbrook. Strictly controlled traffic and reduced speed limits turned out to be blessings that gave me generous opportunities to appreciate the landscape and occasional wildlife around me. It was still early when I turned onto the Interstate, and the winds had yet to build to lethal velocities for the 35-mile run to my next stop. 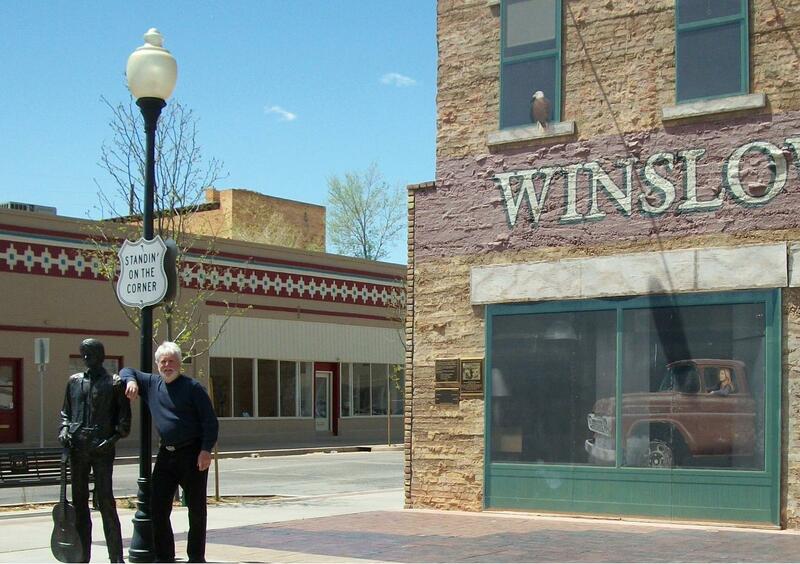 In Winslow I paid homage to one of the great bands of my lifetime and then continued west toward Flagstaff. It’s only sixty miles, but the mistral was back, and the ride took more than an hour. After that, just a few miles south of Flagstaff, I found shelter in the shadows of deep, slab-sided canyons as I rode toward the Red Rock country that’s home to Sedona, AZ. 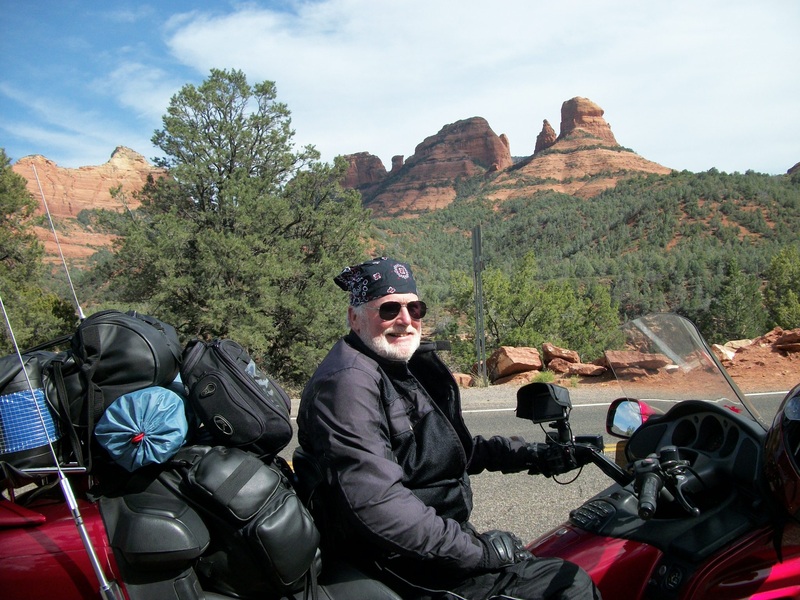 Click here for a time-shortened look at the ride south toward Sedona. Now I felt the magic of the region. I never knew if the next hilltop or curve would reveal a scene from a John Wayne western or from the pages of National Geographic. Rock formations–towers, buttes, monoliths–stood in defiance of the desert flatlands, both in stature and in color. I had crossed the harsh threshold of challenge to savor the spectacle of my reward. Sedona, AZ: A marvelous welcome to the spectacle of the southwest. 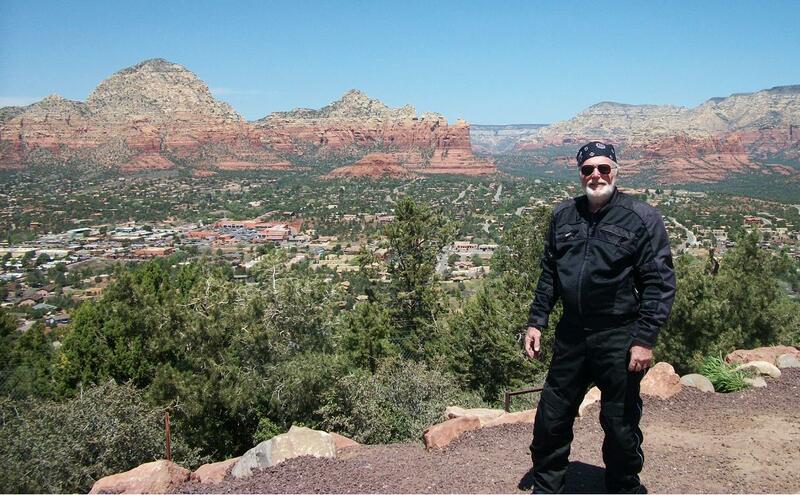 Sedona comes as a bit of culture shock to the first-time visitor. After days of passing through one dusty, vegetation deprived town after another on the long ride across New Mexico and Arizona, I rode into a charming, landscaped, community of upscale shops and restaurants and plush family homes in tree shaded neighborhoods. All around it rise watchtowers of the red rock that gives the area its name. Sedona, AZ: A gem of an oasis in the Red Rock Country. Cottonwood, AZ. : I had no reservation and was lucky to get the LAST available tent site at Dead Horse Ranch State Park. 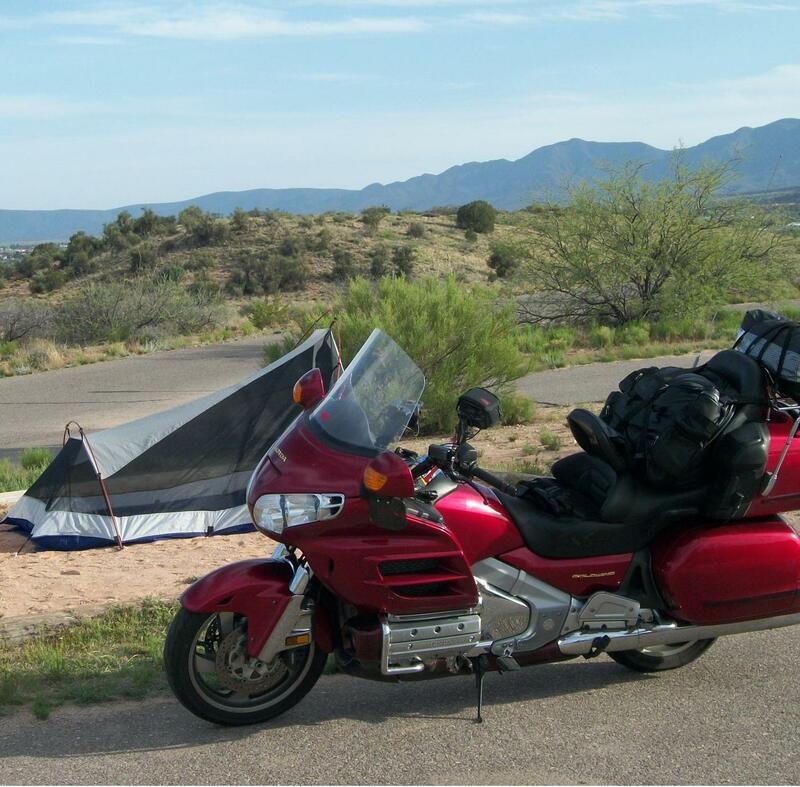 My campsite in nearby Cottonwood at the picturesquely named Dead Horse Ranch State Park was comfortable and located among chatty neighbors… especially the young ones unaccustomed to motorcycles in their midst. Despite it being so early in the season, at nightfall the camping area was booked solid; both the tenting grounds and the huge RV sections were full to capacity. By arriving late in the day and with no reservation, I proved to be the last of the lucky campers. I should make one more point before moving on to the next page in this memoir. I have called the segment you’re reading High Plains Rider, and after I rode south out of Colorado and into the furnace of the real southwest, you might have thought that title misplaced. So I want to share with you a startling lesson from my southwest tour. With the exception of Sedona and Cottonwood, all of the locations described on this page are actually higher in elevation than Denver, Colorado. Flat, arid, desert landscapes they might be, but they are closer to heaven than you might ever have imagined. Denver justifiably boasts of its mile high status at an official elevation of 5,280 feet. But Albuquerque tops Denver by 30+ feet (5,312 ft). My panic rest stop in Laguna, NM, was more than 500 feet higher (5,807 ft). Show Low (not “low,” at all) is almost a thousand feet higher than Denver (6,213 ft). Flagstaff is 1600 feet higher up (6,910 ft). And Santa Fe soars almost two thousand feet above The Mile High City at 7,260 feet. It was clear as I rode south out of Flagstaff and toward the Red Rock Country that the steep canyon roads were carrying me to lower elevations. I passed briefly among woodlands and rolling streams that were a welcome relief after the sparse landscapes to the north. But beautiful, classy Sedona (4,326 ft) and peaceful, laid-back Cottonwood (3,314 ft) are both thousands of feet higher than my home port of Atlanta, and I extend my High Plains status to them, as well. This would be the southernmost limit in my southwest loop. Tomorrow –Day Four– I would turn back to the north and begin a series of greatly anticipated visits to some of our country’s notable destinations. I hope you’ll read on in American Landmarks.